Red calming travel lights are just one of very many optional extras available to order on any of our new build 3.5t - 7.5t horseboxes and are even included as standard on some models, but a lot of people don't understand the benefits of low level ambient lighting. 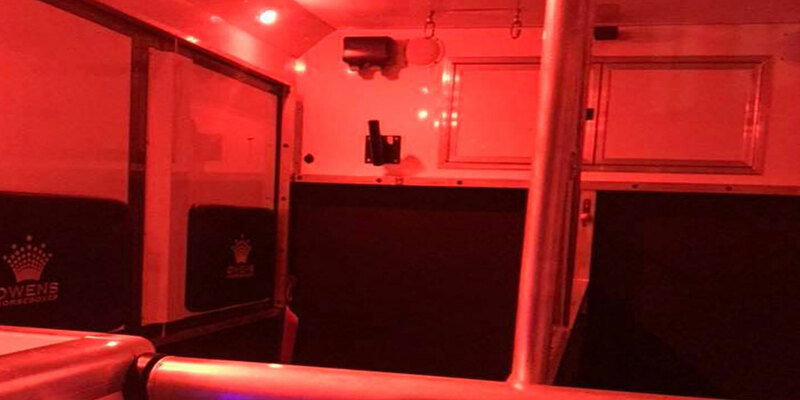 Used when travelling at night, red travel lights in the horse area are beneficial for a number of reasons. 1) Although horses have much better night vision than we do, passing car headlights, street lights, and other disorientating lights may spook or alarm some horses. By using low level ambient lighting in the horse area this doesn't affect the horse so much. 2) After travelling for a period of time in the dark, rather than throw your horse into bright lighting when you unload by travelling with soft lighting on in the horse area this makes the transition more pleasant from one level of lighting to another. 3) Despite some confusion / speculation, it isn't actually a legal requirement to have any internal light on at all whilst travelling horses or livestock, but it can and has been shown to be less stressful for horses helping to keep them calm during their journey. 4) Internal lighting can make monitoring your horse with an internal horse area camera easier as it improves visibility meaning you can safely keep an eye on him without having to stop. 5) White interior lights are illegal whilst travelling at night, so to combat the problems above is not as simple as leaving your interior LED lights on. Only low level ambient coloured lighting is allowed. This is to avoid distracting other road users as white lighting can be confused with oncoming traffic. Our Stallion model has been designed especially for professional use and is our best-selling model for race yards, horse transporters, self drive hire businesses and professional riders and includes soft ambient red lighting as standard as well as a whole host of other safety and comfort features.